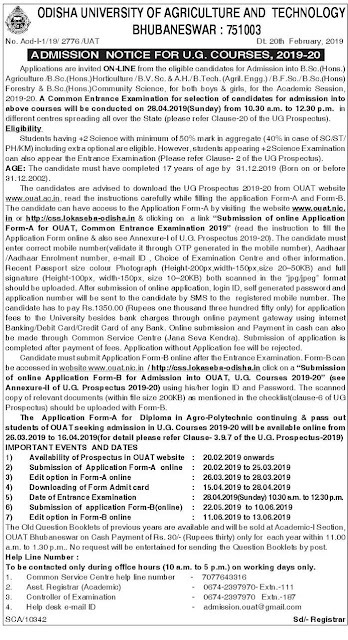 OUAT Admission Notice 2019-20 for B.Sc/B.Tech (Agriculture)/B.V.Sc Courses. 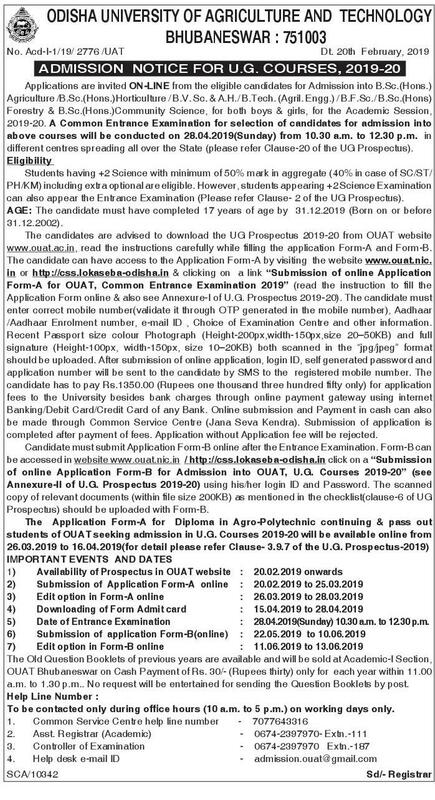 Odisha University Of Agriculture and Technology (OUAT) Published Admission Notification for B.Sc.(Hons. )Agriculture /B.Sc.(Hons. )Horticulture / B.V. Sc. & A.H./ B.Tech. (Agril. Engg.) / B.F.Sc./ B.Sc. (Hons)Forestry & B.Sc.(Hons. )Community Science Course of the Academic Year 2019-20. Now Eligible Candidates Can Apply through Official Website. Candidates Will be Selected On the Basis Of Common Entrance Exam. Entrance exam Scheduled to be Held On 28.04.2019. Eligibility- Students having +2 Science with 50% Marks and 40% Marks for SC/ST/PH/KM Candidates. +2 Science Appeared candidates Can Apply. examination and marks distribution are indicated below.